There’s something of a youth movement at the local square-dancing club — named the Clinton County Country Squares — as seen in this Sept. 6 photograph. One point of recreational dancing is simply having fun. This is the back of a jacket worn proudly by a member of the local square-dancing club. Square dancing can work up an appetite. Just ask Jennifer Clements, 8. Casual dress or square dance attire are both welcome, as are dancers of all ages. 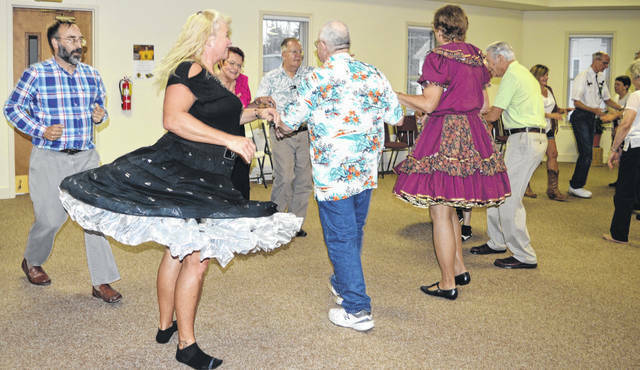 The Clinton County Country Squares club will see to it that everyone has a dance partner. WILMINGTON — More noticeable than even spins by the ladies in crinoline circle skirts are the many smiling faces. 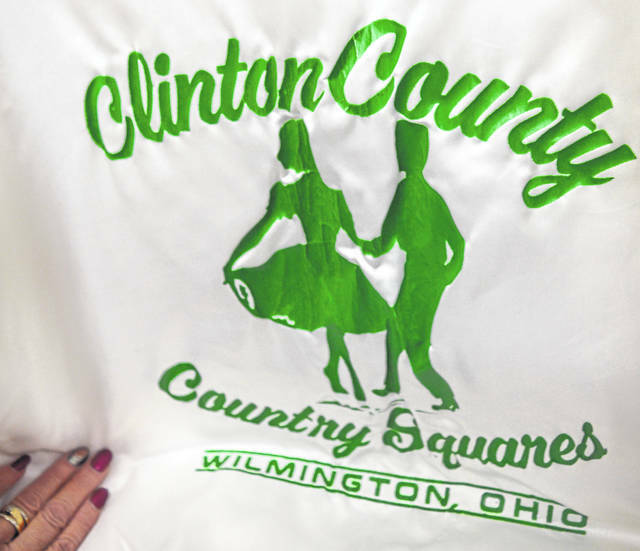 Members of the Clinton County Country Squares square-dancing club range in age from 8 to 89. What they have in common is the fun they experience in modern Western-style square dancing. Sondra Nordyke said she’s been a participant for about 15 years now. “It’s good exercise. It’s good fellowship. 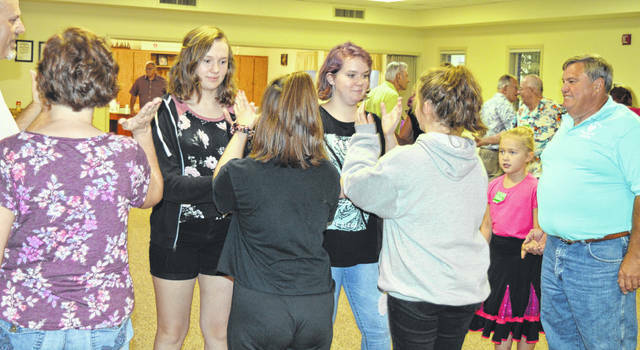 We have lots of fun,” she said during a break in a dance party that was being held in a large room at the Wilmington First Christian Church (Disciples of Christ). Connie Damron said the activity “keeps us moving” and, what’s more, it’s fun. And Pete Lurker, who’s been square dancing since 1973, said, “It keeps your brain wired.” His wife Karen chimed in that it’s fun. Richard Bishop said it’s basically the friendship that draws him to square-dancing clubs. He and his wife belong to several dance clubs. 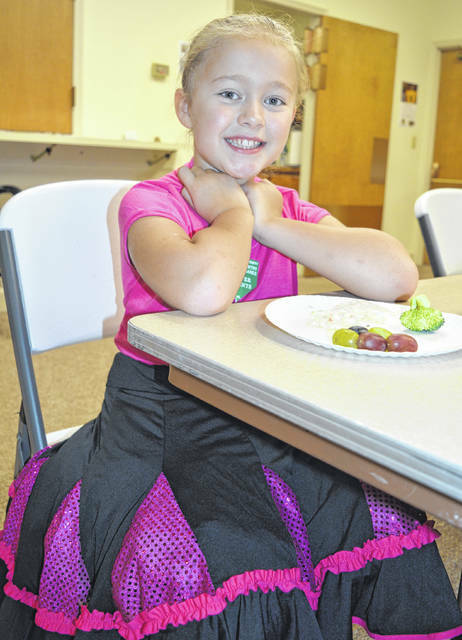 Jennifer Clements, 8, also takes ballet, and in fact she went from a ballet practice to the square dancing party the same day. “I like how it’s fun,” she said. Previously, some home-schooled children participated with the Clinton County Country Squares as their physical education activity. Clinton County Country Squares President Wayne Ames has been part of the club for about six years, and really enjoys the fellowship. “I have a new extended family,” he said. Square dancing, said Ames, is not a senior citizen thing, nor a youth thing. It is something for anyone who can walk, he said. There are of course square-dancing calls to remember and carry out in combination with other dancers, and that’s the main purpose of the lessons that begin this month. 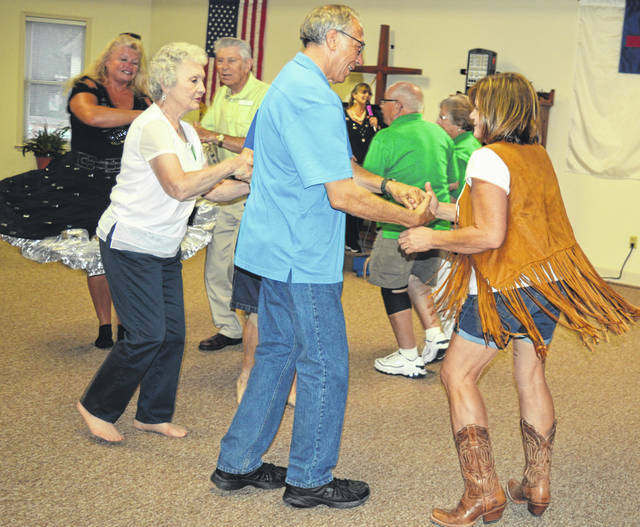 Square-dancing classes are held on Tuesdays from 7 to 9 p.m. starting the second Tuesday in September through May. There also are dances on the first and third Thursdays of each month from 7 to 9:30 p.m. Club members attend a lot of dances in the Dayton and Cincinnati areas. They will be meeting at the DOVE Church, 1499 Rombach Ave. in Wilmington. Casual dress or square dance attire are welcome, as are dancers of all ages. For more information, please “Do Si Do” to the club’s website at clintoncountycountrysquares.org .